20/20 vision never looked better. Welcoming the fall with a new perspective and eyewear. Since I discovered contacts in grade 11, I did my best to avoid wearing glasses in public because I felt no pair suited me. 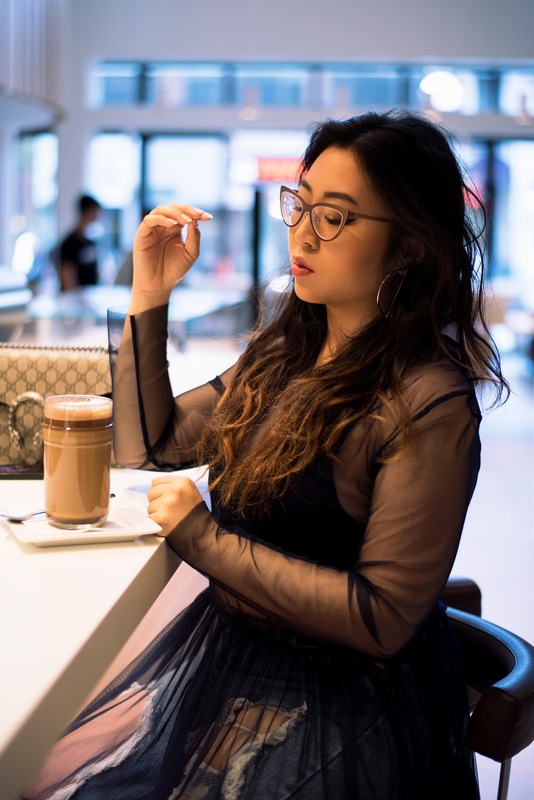 However, after seeing several influencers incorporate glasses as part of their outfit I began to change my perspective and decided to give it a go too. Originally glasses to me were a means of being able to see, but now I feel that they too can be fashionable and used in a way to express one's sense of style. The problem is, that, I didn't have any knowledge on what style would suit me. Neither did I know a store with decent prices (my prescription is very high) and various glasses styles. In the past, I've seen Cleary.ca in passing while walking down Robson Street, and at most entered once due to a friend visiting one of the sales associates. However, I never paid attention since I was never in search for a pair of glasses till now. 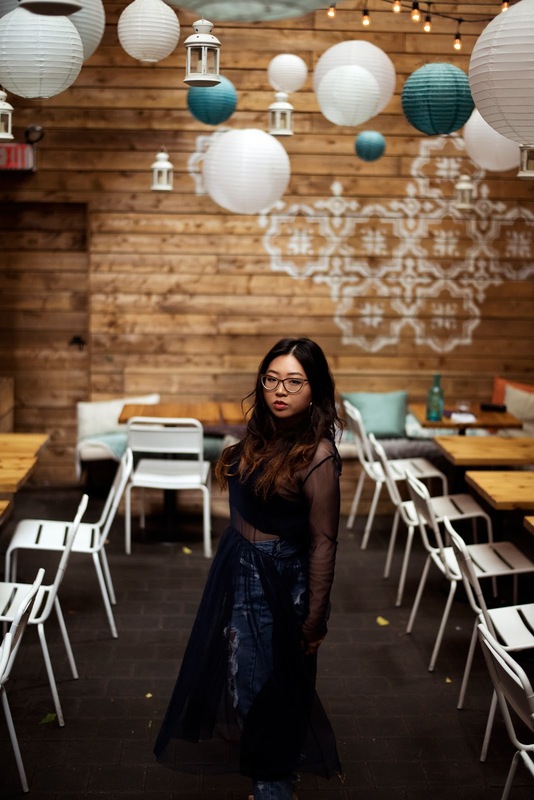 Finding the glasses was really tricky for me, so I wanted to share my experience with Chanel who is part of the Cleary.ca team and how I found my latest pair of glasses! As a frequent online shopper, I am usually able to gauge whether or not if something will suit me, but in this case, I felt an in-person consultation / try on would be more suitable. Depending on one's experience in shopping for glasses, both shopping online and in-store have their pro's and cons. For me, as someone who doesn't know what they want a consultation would be the most logical option because I didn't trust my opinion and would also rather try on in store to ensure the style I selected suited me. Furthermore, I preferred my consultation with Chanel because she had more knowledge on what would suit me, and was able to recommend so many new styles I would have never picked for myself. 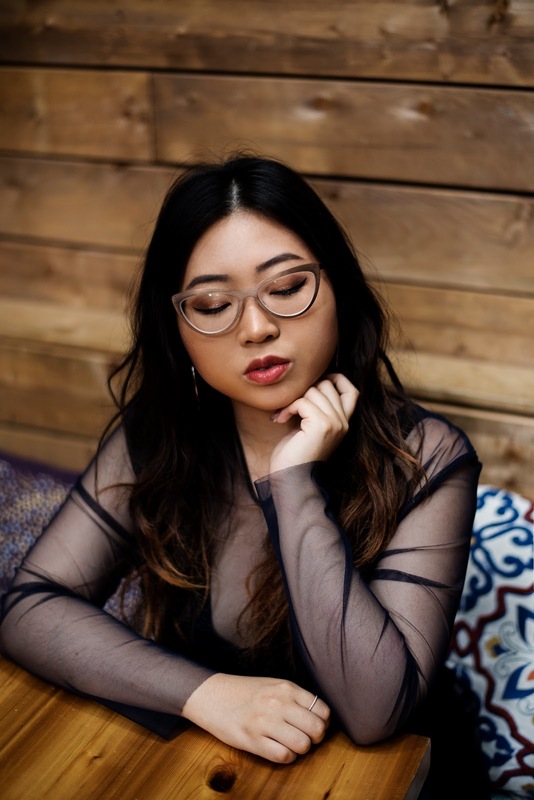 For those new to the glasses game, I would recommend reading Clearly.ca's face shape guide for glasses. I learned I had a heart-shaped face, and that oval-shaped frames would be a plausible option for me. Previously I've only worn square glasses, so I knew I wanted something unorthodox but minimal enough to pair with my colourful and heavily printed wardrobe. Therefore, I selected a pair of Derek Cardigan glasses in the style, Frankie. 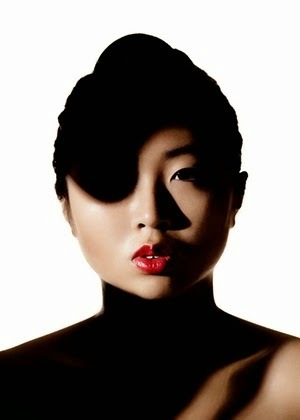 The Frankie glasses had a cat eye shape that was whimsical but grounded as a staple with the muted light brown colour. Originally my first choice of glasses was from the Main + Central collection in the style Thursday. But thanks to Chanel's expertise, she noticed the bridge of the glasses didn't sit on my nose bridge but instead would slide off. Therefore, due to the Thursday glasses not being able to sit on my nose both Chanel and I decided to select the Frankie glasses with nose pads that were more suitable for my face. Even though I am obsessed with my Derek Cardigan glasses, I still remain envious of my friends with higher nose bridges that can pull off the Main + Central collection. 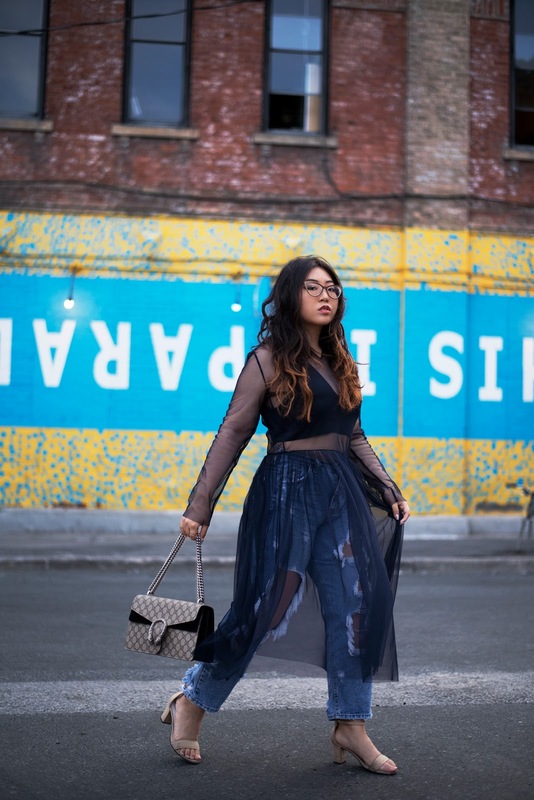 In Toronto, I chose to style the glasses with a tulle top that I purchased in early spring. I also paired my favourite ripped jeans to give more of a casual vibe, though, high waisted jeans would also suit this look. These photos were shot with my friend Ken, who took me around Yorkville to Bar Reyna for brunch. 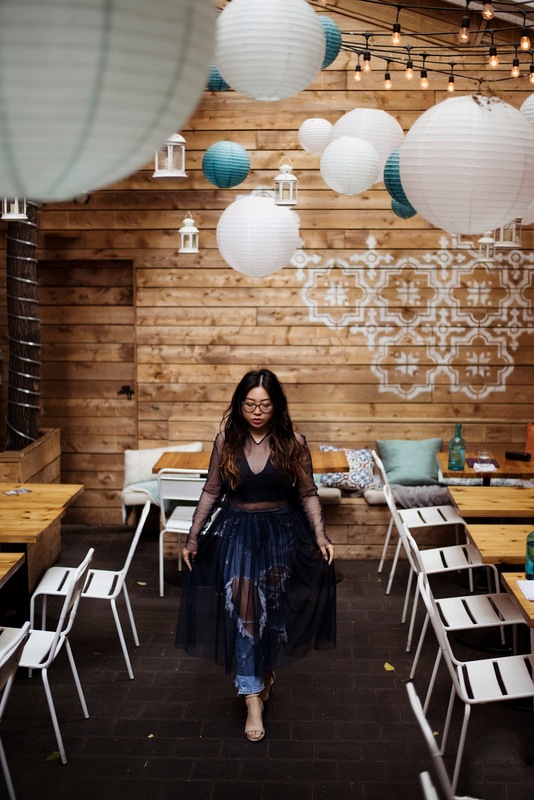 I adored how the photos turned out, and how the outfit managed to pair with the paper lanterns.